SPLICEDwire content is available for print, web, radio & PDA starting at just $99/month! 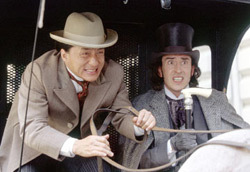 "AROUND THE WORLD IN 80 DAYS"
Jules Verne might have a hard time recognizing his source material in the Jackie Chan action-comedy adaptation of "Around the World in 80 Days," but for non-purists, it's easy to forgive the many liberties taken in this funny, fleet-footed summer-matinee romp. Although the ostensible main character is still screwball Victorian inventor Phileas Fogg (lanky Steve Coogan) -- who wagers against the stuffed shirts of the English scientific establishment that he can circumnavigate the globe in the titular time period -- this version of the story more literally revolves around Passepartout (Chan), Fogg's valet who has his own reasons for traipsing across continents. Passepartout has stolen a jade Buddha from a Bank of London vault in order to return it to its rightful place: his native village in China. Fogg is his ticket to safe passage -- or so he thinks. In Paris, the persnickety Fogg turns up his nose at Impressionism until he meets one of its pretty purveyors (Cécile De France), a spitfire pre-feminist who invites herself along on his adventure. Meanwhile Jackie Chan fights off a kung-fu gang in an amusing, paint-splattering showdown that proves the stunt maestro refuses to let age and injuries catch up with him just yet. In Turkey, the trio is waylaid by a nutcase narcissistic prince (Arnold Schwarzenegger) seeking to round out his day-of-the-week collection of wives. ("Do Tuesdays work for you?" he leers farcically at De France.) In China it's revelations, family reunions and more spectacular and silly kung fu as Passepartout comes clean and kicks butts with some help from village holy man Sammo Hung. Then Fogg and friends head across the Pacific to America, where a broken wagon wheel is replaced by a couple bicycle salesmen named Wilbur and Orville Wright (deadpan delights Owen and Luke Wilson), and where the under-construction Statue of Liberty is the setting for one more crazy kung-fu face-off. All this, a bit of sabotage, and much more go by in a swift 93 minutes, but the movie doesn't feel like a highlights reel because each scene is milked for maximum character (ill-at-ease Fogg is hopeless in foreign cultures without Passepartout) and maximum laughs (ditto). Admittedly, the script is sometimes clunky: For the sake of expediency the antagonistic head of the Royal Academy of Science (amusingly blustery Jim Broadbent) is made out to be both the most powerful man in Britain and a pooh-pooh-er of progress. At times it's hackneyed too: Fogg is introduced trying to "break the 50-m.p.h. speed barrier," a scientific hurdle invented by the screenwriters. And the movie certainly requires a fanciful suspension of disbelief. But director Frank Coraci ("The Wedding Singer") shows enthusiastic creativity in pulling it all together and giving the comedy time to breathe by, for example, transitioning quickly between episodes with imaginative, cartoonish-watercolor CGI flyovers taking us from one exotic locale to the next. More importantly, the fun clearly being had by the cast is downright contagious, and Jackie Chan is in top form as a comedian (no one in the world does a funnier startled double-take), as a martial artist and as a fight choreographer. This man who used to jump off buildings and break bones for his movies may be getting a little bit of help from special effects these days, but he can still rouse a cheer for his amazing fight scenes and his witty physical humor.